On January 20th we will march again, this time for our voices and votes to be heard! This peaceful demonstration will bring attention to the 2018 elections, magnifying the work being done by community organizations to turn out the vote! For their support, we thank the Kumeyaay people on whose land we march. First we MARCH, then we VOTE! 1. Park at SDCCU Stadium (formerly Qualcomm) and catch the trolley. MTS has 5,000 free parking spots and will boost service to every 7.5 minutes beginning at 8 a.m.! Also, the Compass Cloud mobile ticketing app is the fastest option to get Trolley passes in advance. Exit at the County Center/Little Italy Station. 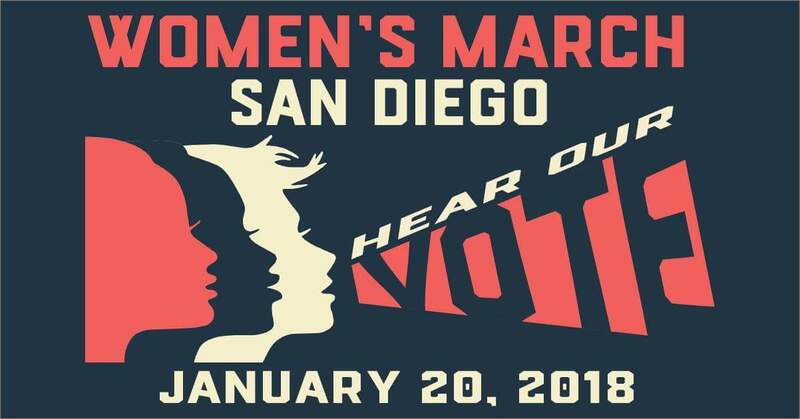 All Women’s March Trolley service info can be found here. 2. Purchase a bus ticket through Amtrak, they will have bus service in lieu of trains. Tickets are limited. 4. Buy a ticket from Rally Bus. As long as 30 or more people sign-up for a bus, it will run. Prices start at $30 round trip. 5. Search for parking in downtown San Diego.